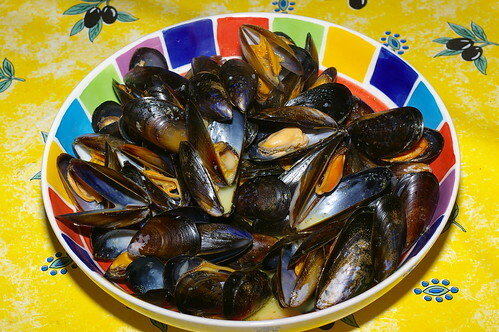 Mussels with cider and cream, a photo by La belle dame sans souci on Flickr. I bought a bag of mussels on the way home from work last night, all nice and clean ones. I had shallots, garlic, cream, cider and some persillade so it was a simple matter to cook the shallot and garlic off in some butter, add the mussels with the cider and cream and steam them for a few minutes. A dollop of persillade was added and mixed in and that was it. Some crusty bread and the rest of the cider to drink completed a lovely simple supper.